Weeks after getting the Dotmod Dotsquonk mod in for testing, I still don’t know what it is. Is it mechanical, like the company claims? Is it semi-regulated, even if the company claims it ISN’T? I’m as confused now as the moment I opened the box. 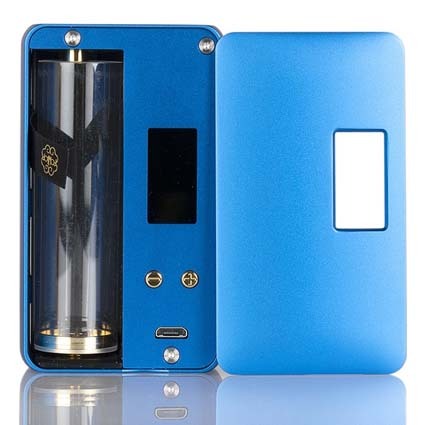 And because of this, I’m going to spoil the ending – the Dotmod Dotsquonk is getting a negative mark because if an experienced vape reviewer can’t decipher things, how could someone new to the party figure it out? Bottom line – mechanical mods can be VERY dangerous with improper use. And if the company can’t make it clear what a device should (and shouldn’t) do, why should I endorse it? Hell, just look at the “official” description and see if you’re as confused as I am. The Dotmod Dotsquonk 100W epitomizes the innovation and pursuit of beautiful designs at full display, integrating a regulated dot Chip technology with a 100W maximum output and accommodating single 18650 / 20700 / 21700 and 8mL squonk bottle. Okay, so it’s regulated, according to this verbiage. And it can take 21700 cells? Um, no it can’t, no matter what the above text has to say. I tried but it was readily apparent that this snug compartment was not intended for the easy installation and removal of the bigger batteries. Also, the instruction booklet shows a 20700 cell in the diagram, with discussion of 18650s with an adapter. No mention of the 21700 anywhere. Maybe the device actually IS 21700-compatible… but should I take the chance in case it was a typo? On a potentially unregulated device, using the wrong cells could be tragic – why on earth would Dotmod be so careless with its documentation? ***IMPORTANT NOTICE: This product is for advanced users only. This is a mechanical (not regulated)mod, intended for use by experienced vapers, and requires regular maintenance. Dotmod utilizes its own proprietary dotChip technology from the dotBox 200W, downgrading the power to a maximum 100W while retaining all the advanced temperature control settings and customizable adjustments. No one can ever claim Dotmod doesn’t make attractive vape gear. 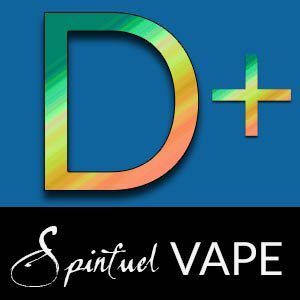 From their extensive line of RDAs and tanks to their newer vape mods, the company has a distinctive look and feel that’s entirely its own. So, your love of this device will come down to whether or not you like that aesthetic. Personally? I love it. I’m a sucker for clean lines and unadorned designs. 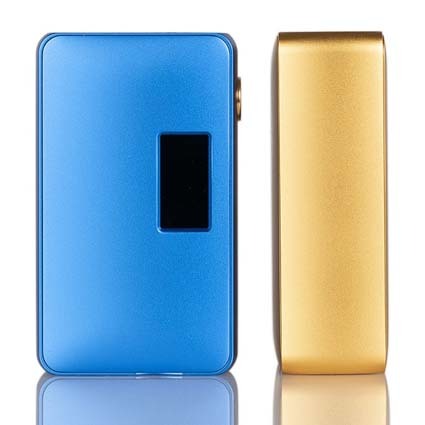 This slender, palm-friendly single-battery squonk box certainly wants beauty to come from within, because the exterior is all but bare, save for the company’s logo and some nice curved edges. The side panels are removable, in case you want to get into customizing the exterior look and feel. I haven’t seen too many other designs in the wild, but knowing the rabid high-end vape community, there’s probably some nice variations out there. A little Google-fu will get you there… but we won’t be reviewing them here. On a purely aesthetic level, I appreciate the company’s desire to keep the exterior uncluttered, but come on – a screen this nice (and informative) should be on the outside of the mod. On a functional level, how is this amount of control and customization mechanical in any way? I’m all for protections (big time) but those hearty vape purists who want a true mechanical experience? Yeah, this isn’t it. I have to say, the confusion on this device even trickles down to the flippin’ squonk bottle. The official line claims it’s an 8mL bottle, but just by looking at the squared off, firm and flexible bottle, you know it can hold a lot more than that. My guess? The bottle is actually 11-12mL, give or take depending on how heavily you fill. All I know is that I refilled this thing a LOT less than I would a standard 8mL bottle. Thankfully, it’s an easy refill process, with simple removal and reinstallation, thanks to the layout in the small space behind the door. That aside, the bottle itself IS quite good, with the right amount of give and firmness. I enjoyed the smooth squonk action with the bottle, even if “squared off” squonkers always seem to break over time. If I intended on still using this device, I would keep you posted. But that’s not on the agenda, as you’ll see in the next section. As frustrated as I am with the company for its lack of coherence and transparency, when I put the Dotsquonk to work, it did a nice job, with a balanced level of power and smooth draw action. The onscreen adjustments were easy to perform, even with the minuscule control buttons, and the fire key was stiff and responsive. The device also did a good job reading my coils, in both TC and wattage modes. I had little trouble making adjustments, and once things were set, they stayed that way. I DID have a problem with the narrow width of the device as a whole. Thanks to the curved edges and doors, any atomizer larger than 24mm immediately had overhang – even the company’s own RDAs! Things worked just fine no matter the width, but on a mod so focused on aesthetics and style, this was a surprising oversight which affected my enjoyment of the device. As mentioned earlier, the squonk action was nice once everything was in place. Using a wide range of bottom-feed atomizers from my collection, all worked well without any hiccups. And the device did put out some decent, accurate power… at least according to where I set things in TC and wattage modes. 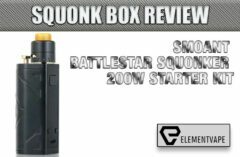 BUT, the “mechanical” side of the Dotsquonk came to light less than an hour later, when the mod started throwing erratic hits and on-screen warnings (which were hidden from view by the side panel). I’m thrilled the device stopped itself before danger set in, but how on earth does a 20700 cell die after less than an hour of moderate use? No matter how many adjustments I was making, this should have given me a lot more longevity than this. 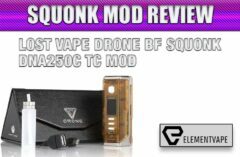 The Dotsquonk absolutely murdered my battery life, which needs to be recognized before dropping hard-earned cash on the device. As far as squonk mods go, the Dotsquonk does its job, with a hell of a lot of quirks and confusion along the way. – Honestly, is it mechanical or not? I hunted high and low for reasons to look past the confusion from Dotmod’s website and instruction manual, but I really can’t. We’ve seen too many careless vapers suffer life-threatening situations because of this (especially in mech devices) so it’s the job of the company to ensure its customers have the right information, conveyed in a clear manner. 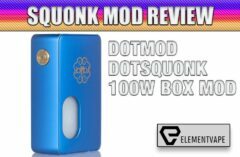 Does the Dotsquonk work well? Sure. And the display, features and protections all seemed right in line with a quality device. But it was never made clear what the mod is, how it should truly be operated, or even what types of cells should be used. As an experienced user, I figured it out, and had no issues. But for newcomers, this could be a problem – and that’s reason enough for the lower-than-expected score. I didn’t give it an F. But I probably would have been justified in doing so. Do I think Dotmod is purposely careless? No. 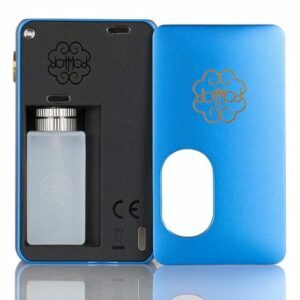 But the confusion it caused will ensure I leave the Dotsquonk on the shelf, instead of being put to use.